Brett Luke | The Journal Gazette Fort Wayne's Ike Anigbogu drived against Delaware on Saturday at the Coliseum. Brett Luke | The Journal Gazette Walter Lemon Jr. of the Mad Ants drives towards the baseline against 87ers Jacob Pullen on Saturday at the Coliseum. 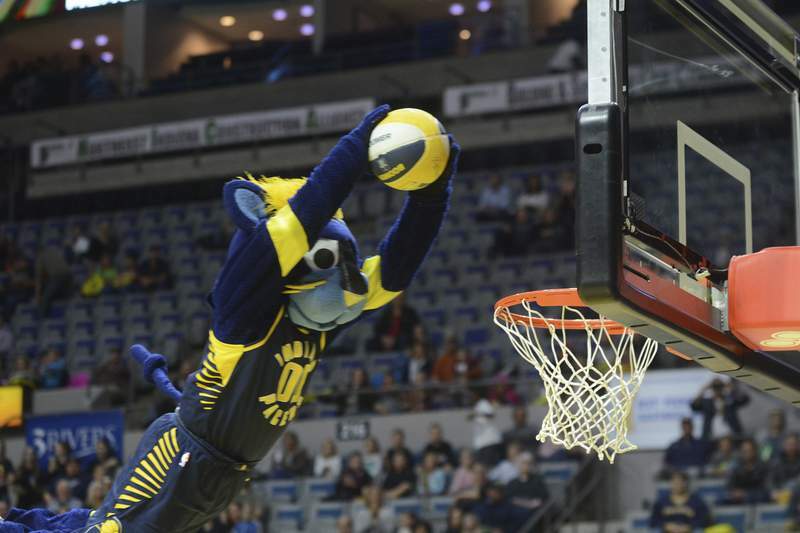 Brett Luke | The Journal Gazette The Pacer’s mascot Boomer dunking during the halftime show at the Fort Wayne Colisium during the Mad Ants Vs 87ers game. 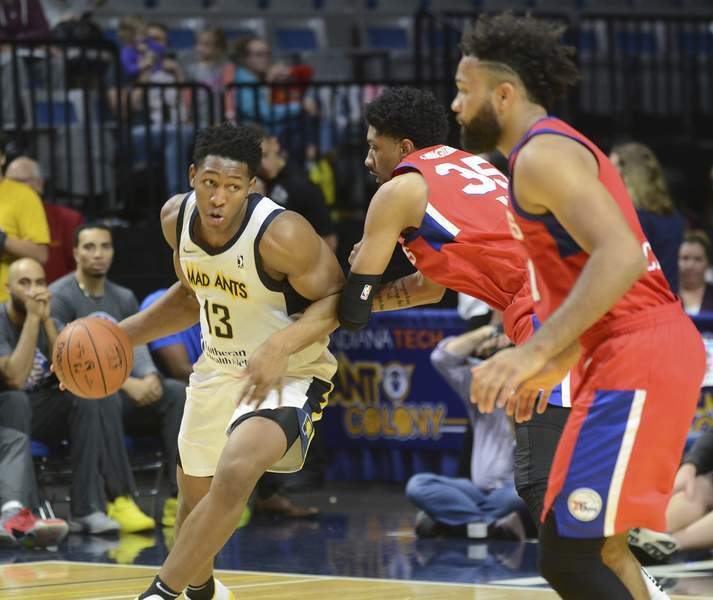 Brett Luke | The Journal Gazette Walter Lemon Jr. of the Mad Ants kicks the ball out to Ike Anigbogu during the third quarter against 87ers' James McAdoo on Saturday at the Coliseum. 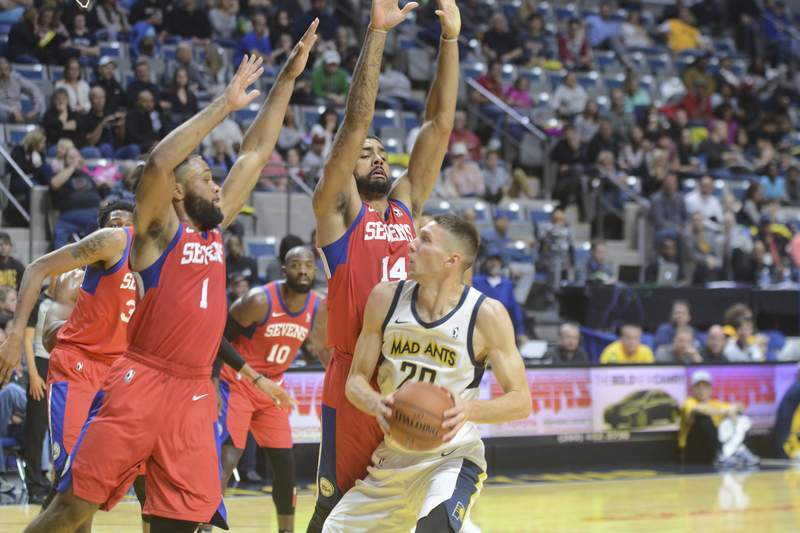 Brett Luke | The Journal Gazette James Blackmon Jr, left, and James Michael McAdoo of the 87ers deny Jarrod Uthoff of the Mad Ants a shot on Saturday at the Coliseum. 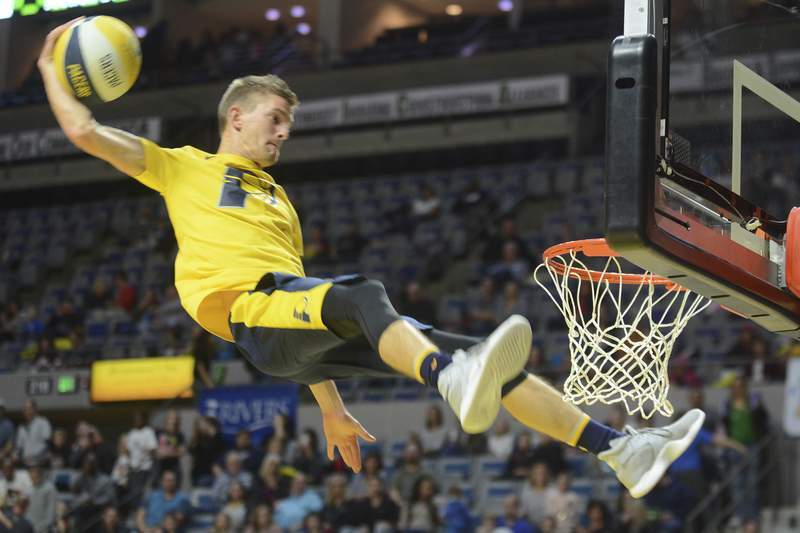 Brett Luke | The Journal Gazette “2 Thin” of the Pacer’s Power pack dunking during the Mad Ants Vs 87ers halftime show. 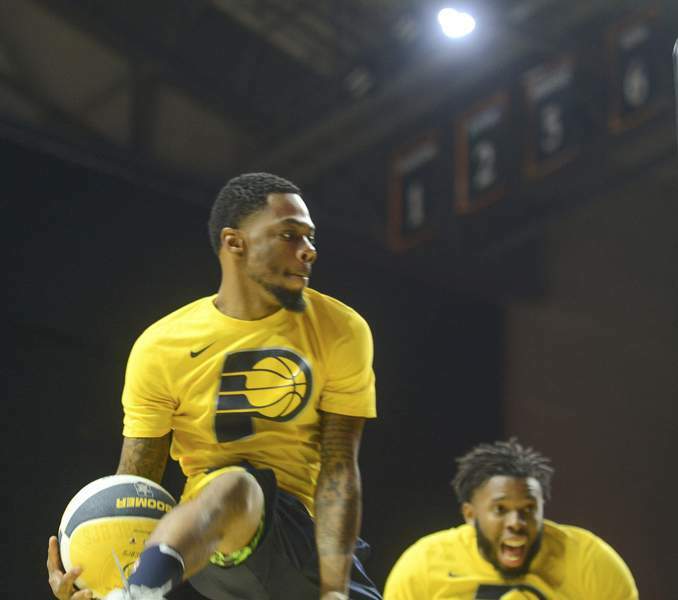 Brett Luke | The Journal Gazette “D-low” , left, and Windmill of the Pacer’s Power Pack dunk at the same time during the Mad Ants Vs 87ers halftime show at the Fort Wayne Colisium. 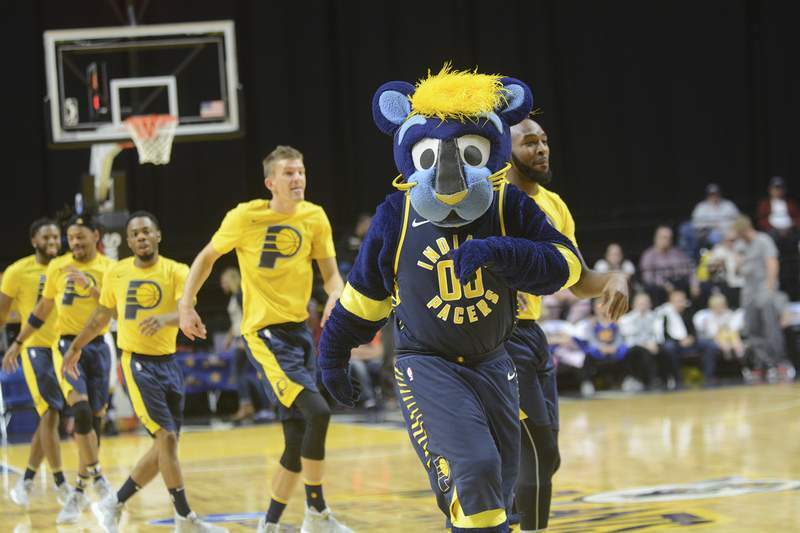 Brett Luke | The Journal Gazette The Pacer’s Boomer and the Power Pack open up the Mad Ants Vs 87ers halftime show at the Fort Wayne Colisium. Brett Luke | The Journal Gazette Fort Wayne's Walter Lemon Jr. shoots a jumper over Delaware's Jacob Pullen on Saturday at the Coliseum. Brett Luke | The Journal Gazette Fort Wayne's Ike Anigbogu scores against Delaware on Saturday at the Coliseum. 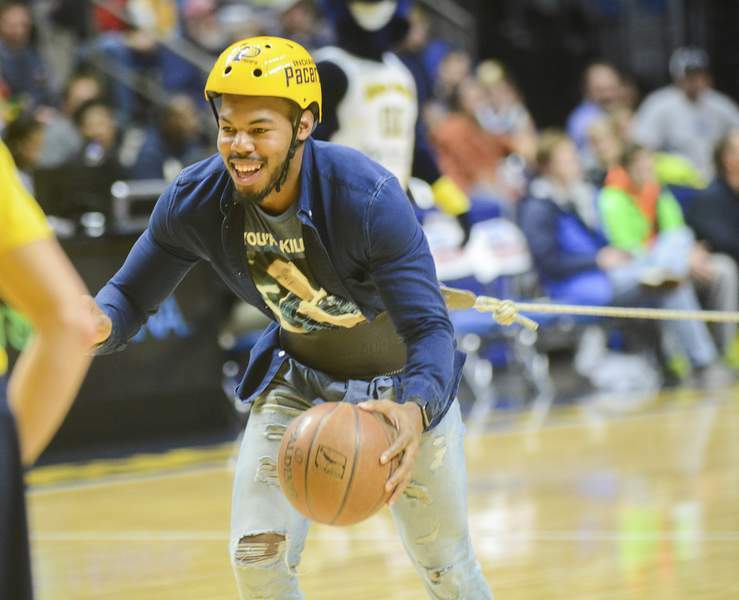 Brett Luke | The Journal Gazette Akeim Kelsaw participates in the Pacer’s halftime event. His objective was to score more baskets than his opponent who is tied to him on the other side of the court. James Blackmon Jr., the former Bishop Luers and Indiana University star, had 20 points on 8-of-11 shooting for the Delaware 87ers tonight. 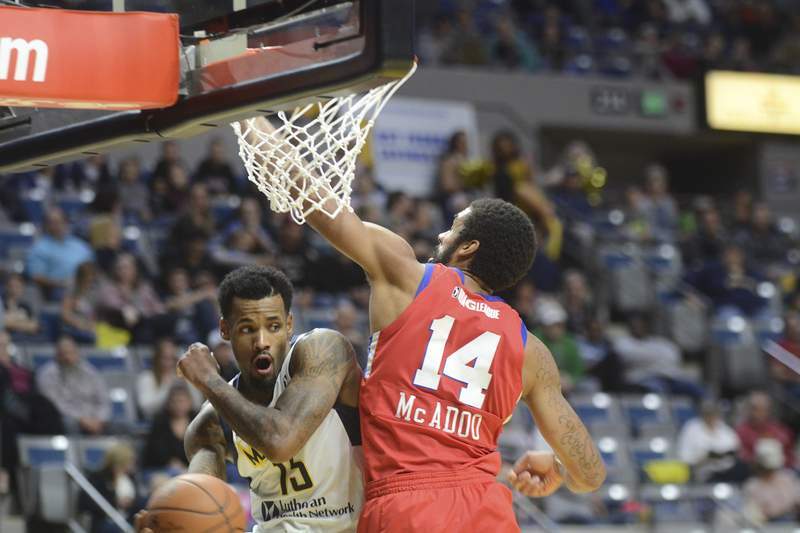 But they remained winless in a 127-115 loss to the Mad Ants, who are 4-1 and on a four-game winning streak. Blackmon, a guard, is averaging 9.6 points, 3.1 rebounds and 22.1 minutes, after he averaged 17 points, 4.8 rebounds and 30.5 minutes last season at IU. 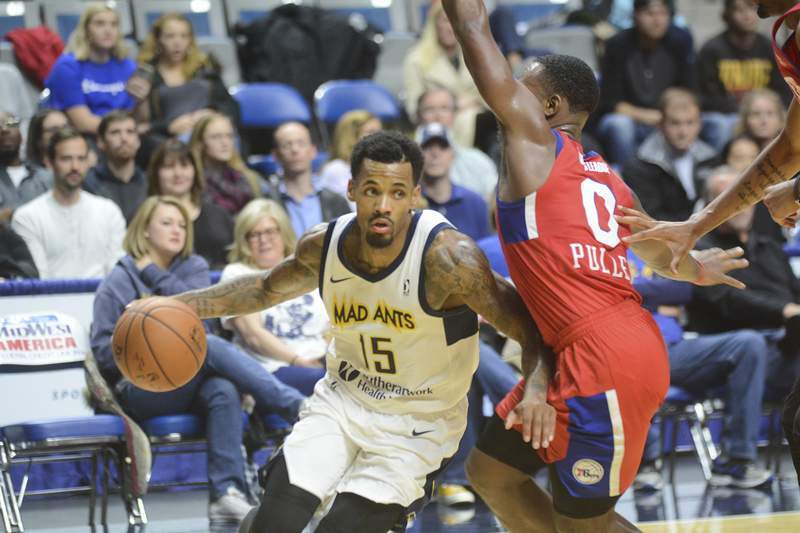 It was another terrific game for the Mad Ants’ Walt Lemon Jr., who equaled his season high with 34 points. Stephan Hicks added 20 points. 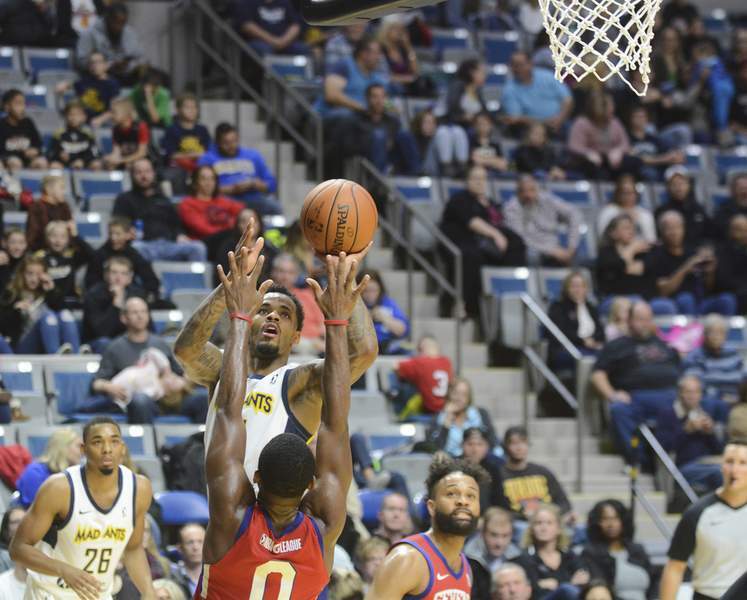 Jarrod Uthoff and Ben Moore had 19 apiece in a game that saw Fort Wayne make 54.5 percent of its shots and Delaware convert 53.1 percent, led by 23 points apiece from Jacob Pullen and Christian Wood. 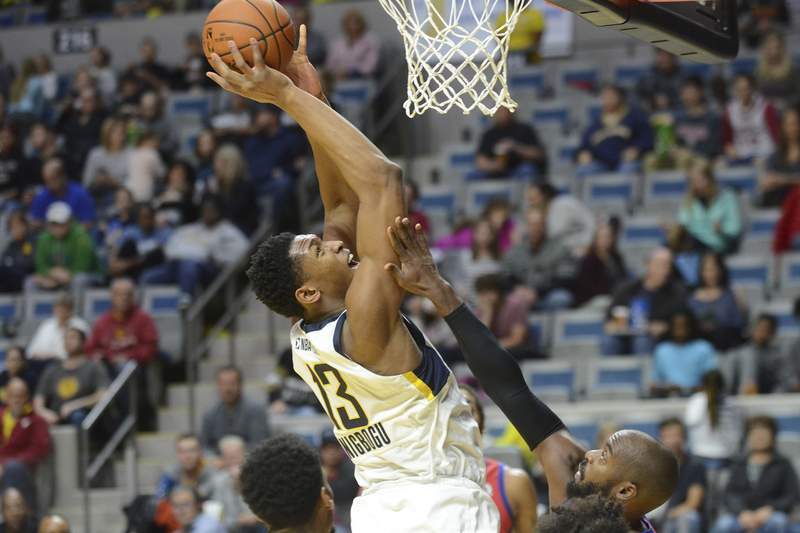 As for Ike Anigbogu, who played his first G League game since being sent down by the Indiana Pacers, coach Steve Gansey was mostly pleased with the rookie’s performance of 13 points and seven rebounds. Anigbogu is on a minute restriction – 25 minutes – because he’s recovering from knee surgery.